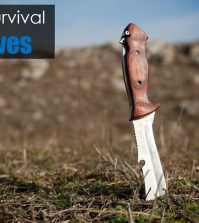 Home > Diy Survival Gear Reviews > What’s Your Every Day Carry ? The term EDC also refers to the philosophy or spirit of ‘preparedness‘ that goes along with the selection and carrying of these items. Implicit in the term is the sense that an EDC is an individual’s personal selection of equipment, arrived at after deliberation, rather than a standardized kit. 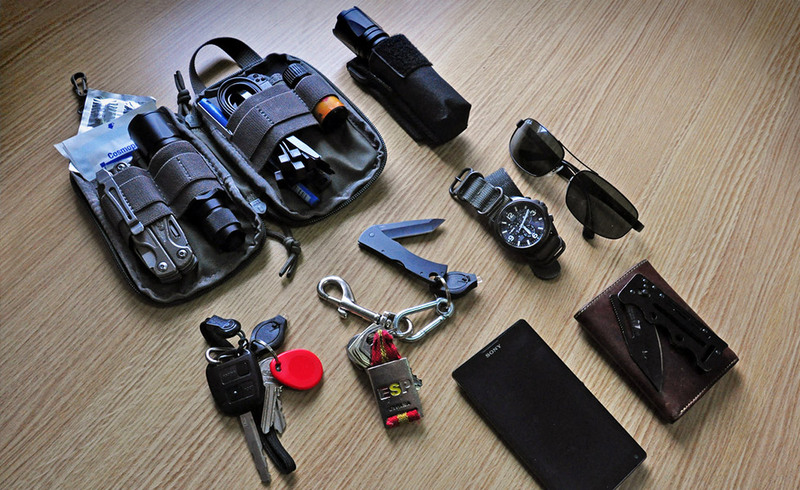 EDC items normally fit in pockets or a small pack, and/or are attached to clothing such as a belt. Emphasis is placed on the usefulness, accessibility and reliability of these items. The core elements of a typical EDC might include a knife, a flashlight, a cell phone, and a multi-tool. There is a spectrum of situations for which an EDC might be devised which range from the predictable and mundane to the rare and serious. 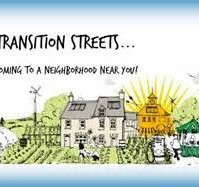 Some people focus on unthreatening, day-to-day situations and are principally interested in ways to efficiently organize common items like pens, keys, cell phones/smart phones and cash/credit cards. However, the EDC mindset leans towards tackling problems or dealing with challenges so it is rare to find an EDC that does not include tools of some kind, such as a multi-tool. In addition, many EDCs include some provision for tackling less common situations or emergencies, such as an injury or becoming lost or stranded. Thus, an EDC kit could include an emergency whistle, a way to start a fire or a small first-aid kit. Some people who carry EDC items include personal protection in their selection criteria when choosing equipment. Their EDC kits may include handguns, knives suitable for defense or items such as pens which can also function as kubotans. In addition to the usual criteria for assembling an EDC, local regulations and legislation can become a factor. Many countries have imposed restrictions on carrying knives and all govern ownership of firearms. In countries where civilians are permitted to carry firearms, such as the United States, there may be additional local laws regulating carrying a concealed weapon (CCW) or openly carrying a firearm. Some extreme EDC systems are devised in advance for use during major disasters often in conjunction with a bug-out bag. Beyond that, people who are survivalists prepare for a future breakdown of society. While some simple EDCs can be distributed efficiently among pockets in everyday clothing, for many people the ideal selection of gear is at odds with the way they prefer to dress. For that reason, carry options are frequently expanded by the addition of clothing accessories like a fanny pack, purse, small day pack, or even footwear like long boots or a vest with pockets. The multiple large pockets of cargo pants make them a popular choice among people who carry EDC items. Frequently the kinds of pocket knives, flashlights and other items selected for EDCs tend to be expensive. EDC items may also be items designed for so-called ‘tactical’ use, meaning that they were designed for military, police or similar organizations. The justification for the expense and the ‘tactical’ bias of many EDC kits is that these are items that might be carried for long periods of time before they are finally required, at which point they may be called upon to perform in extreme situations. List of Commonly Carried Items. 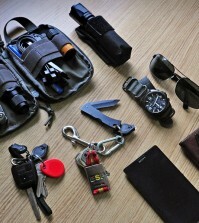 Specific items utilized for EDC will vary based on the activity and environment. Those who work in a warehouse or outdoors may carry a pocket knife or box cutter and work gloves. For those who are in the medical field, having emergency latex or nitrilegloves can be the difference between life and death for the individual who requires immediate medical assistance. Pens, pencils, and memo pads are the basics. Many college students can enjoy the freedom to carry a pocket knife, multi-tool, or even a concealed handgun in case of emergencies depending on state and school regulations. For those who live in a disaster prone area, having a flashlight and a communication tool may be essential. Having a bug-out bag and the proper amount of food and water ready and accessible is part of disaster readiness. 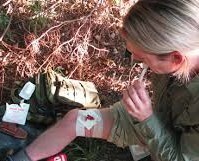 Those whose partner(s) or team members carry a weapon of some kind, may carry a first aid kit or extra ammunition as support in case of incident or accident. Those who (might) require medical attention or are prone to sudden ailments (or are often with someone else who does) may carry prescribed medicine. Having a time piece is sometimes necessary for timing critical everyday actions or to be on schedule. Personal safety is a broad and complex term but in EDC, it usually means carrying a defensive weapon such as a firearm, knife, tactical flashlight, tactical pen, pepper spray, stun gun, or a small impact weapon. A compass for orientation can be critical in the wilderness (and useful even in a crowded metropolis). Game wardens or forestry rangers carry a compass and rope for their daily field work and depending on distance they might also carry fire starting and water purification items as well. An air horn may be useful while jogging in rural areas to scare off aggressive wild life.